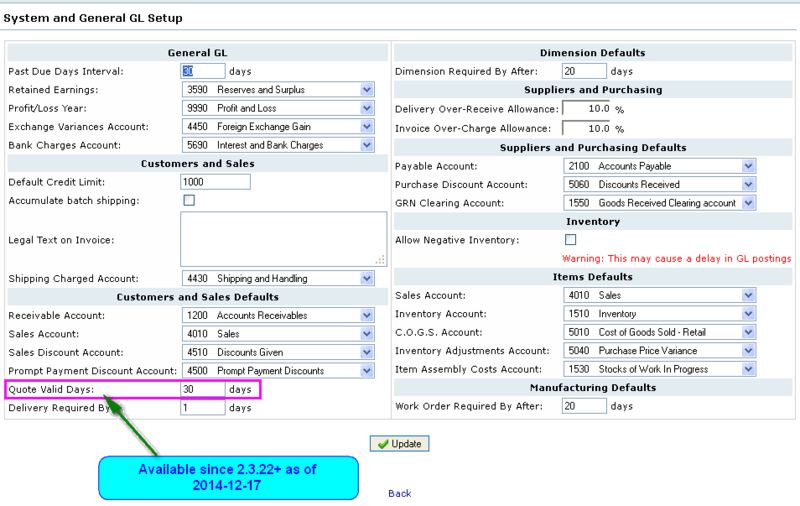 Setup default values and GL account assignments for various aspects of your business. Screenshot for FA 2.3.x is here. Tax Algorithm to be used - Forum Post. Legal Text on Invoice - Any legal text, like terms and interest charges for overdue payments, which you want included on all invoices. Deliveries Required by - Number of days by which a sales order is considered overdue for shipping. Dimensions Required by - Number of days by which a dimension is considered overdue. Delivery/Invoice Allowance - Percentage by which you allow for deviation in pricing. Allow Negative Inventory - All inventory to be have a negative value. See the tips and tricks below for more information. Work Order Required by - Number of days to allow for manufacturing of items. The problems with the 'Allow Negative Stock' has earlier set the Average Material Cost to 0 when stock went below 0. This was due to the unsecurity about which prices to use during the 'negative' period. 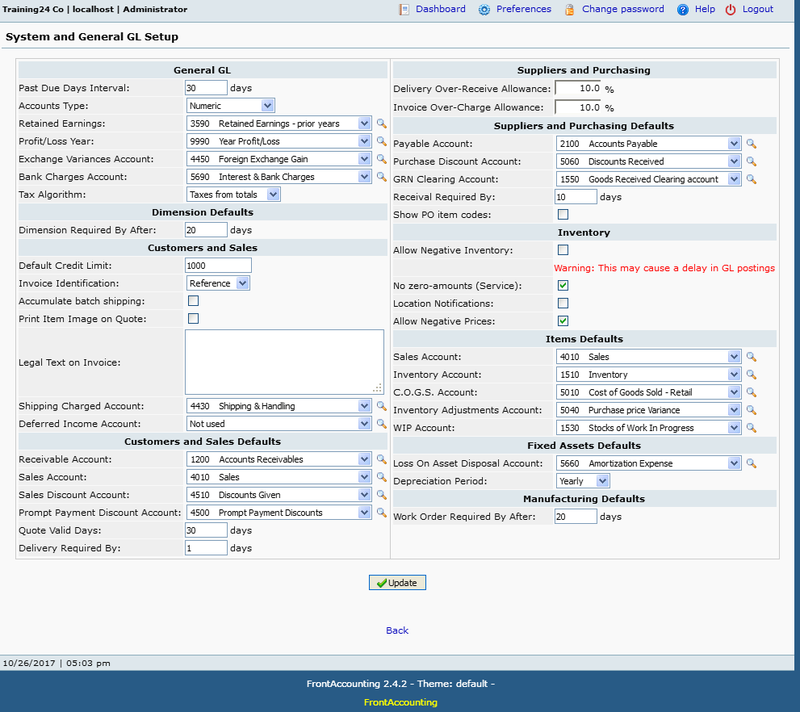 We have now fixed this, from release 2.2.6, so it works almost like in Oracle and QuickBooks. The Average Material Cost still stays there from the last transactions before the stock went below 0. This value is used when delivering items. When a PO arrives or an Item Adjustment is done, the average material cost is now based on this new value until the stock again is above 0. The GL Inventory/COGS accounts are adjusted to the correct prices for deliveries during the 'negative' period. A Cost Update is done in the background. Then, when stock is above 0, the normal algorithms works as before. If you have the 'Allow negative stocks' marked, you can set the Standard Costs for new items, even if there is no stock in there yet. This value will be used during deliveries. When the correct prices are there, the GL accounts are updated just as before. But doing this will help you getting an estimated COGS. If you don't enter the Standard Cost, you will have to wait with COGS until there are better prices available (when entering POs or Item Adjustments).